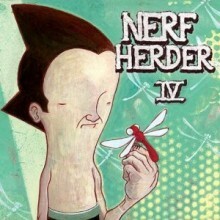 While quite a few fans assumed that they had broken up long ago, punk/nerd rock group Nerf Herder surprised everyone in 2005 when they began playing shows once again. With the original lineup playing together again the group has now released the appropriately titled IV, which tries to go back to the quirky and witty nerd humor seen on their original album. And for the most part, Nerf Herder has returned to what made them so great years and years ago without listeners even begging them to do so. For those not familiar with Nerf Herder, their lyrics are often seemingly random and nonsensical but also contain a lot of subtle references that not all listeners may pick up. Albums from this band have always been somewhat fun “party” releases not unlike some of Weezer’s earlier work, though Nerf Herder definitely has a more punk feeling to them in comparison. And for the most part, IV continues in the tradition of witty and bizarre lyrical content. However, while the first half of this album is great but towards the end the quality dips slightly. But vocalist Parry Gripp still sings as well as he did before ensuring fans will still enjoy this release. The songs on IV often alternate between slow and fast paced riffs, and while this does help to give the album some variety it should be mentioned that the faster paced and more energetic tracks are generally the more memorable ones this time around. As one might expect the riffs themselves are fairly simplistic but this helps to further highlight the lyrical content and make IV a release that is fun and easy to get into, fitting in with what Nerf Herder has done all along. Simple is better in this case, though some listeners may wish there were just a few more fast paced tracks. Long time fans may not find IV to be as good as the band’s first or second album, but they will certainly find that Nerf Herder has not lost any of the elements that made them great after all of these years. This isn’t a perfect release by any means as the slower songs tend to drag from time to time, but as a whole this is definitely worth getting. Nerf Herder’s still got it, and hopefully this isn’t a one album deal as these guys could still impress further down the road.